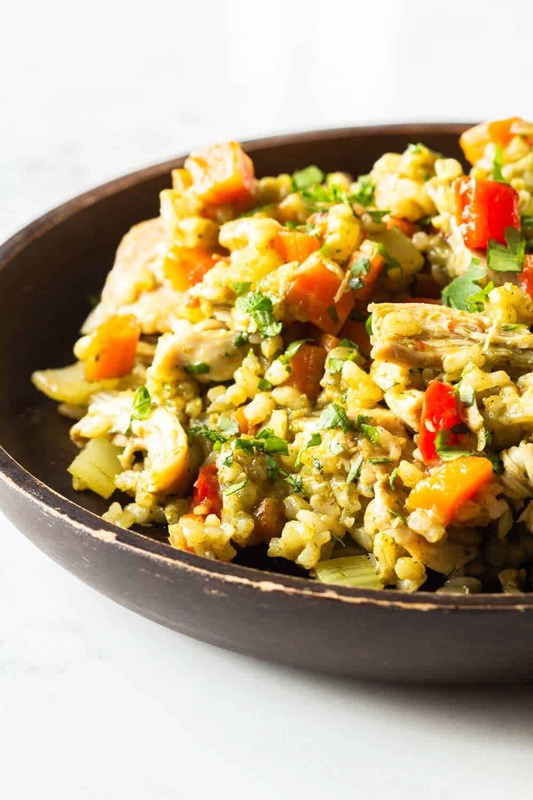 This Crock Pot Chicken and Rice recipe is Peruvian-inspired and super flavorful. 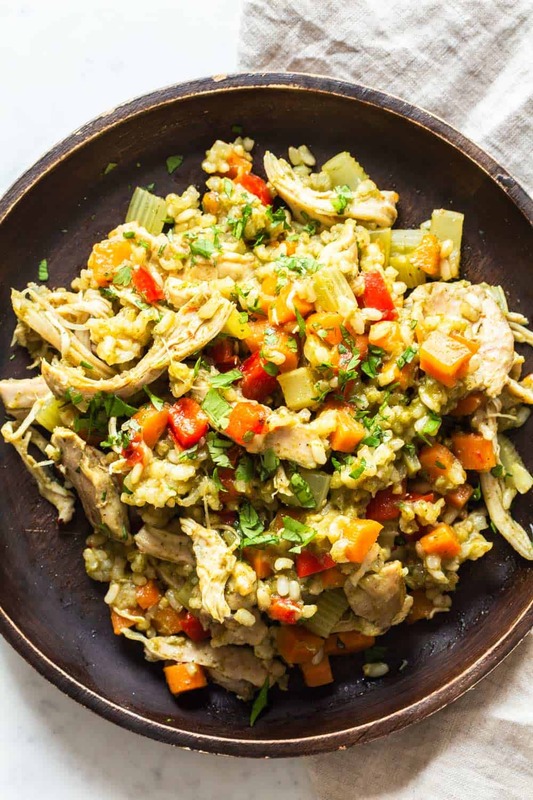 A healthy crock pot recipe full of vegetables, delicious cilantro, fiber-rich brown rice and yummy chicken thighs. After the huge success of my Instant Pot Chicken and Rice but many people asking in the comments how they can convert the recipe to be made in a slow cooker, I just HAD to go in the kitchen and test and test and test some more. I finally found the magic formula for the Chicken and Rice in Crock Pot version. 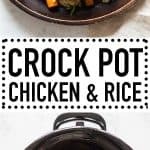 I assume you can use any slow cooker for this but I’m titling the recipe Crock Pot Chicken and Rice because that’s the brand of slow cooker I used for all my recipe testing. The recipe will for sure work in a Crock Pot brand slow-cooker. So, based off of my research on Instant Pot Brown Rice cooking times, I assumed I would get the best crock pot rice results using brown rice. Can You Put Rice in a Crock Pot? Turns out YES you can! And no you can’t cook it like in a regular pot or a pressure cooker or rice cooker. I first thought, it’ll be in the pot for sooo long, tons of water will evaporate and I’ll have to add A LOT. However, it became extremely mushy with a 1-2 ratio plus veggies and chicken on top. Vegetables and chicken release quite a bit of liquid so we have to subtract that from the total liquid needed to cook rice in a slow cooker. So once that was clear I basically just had to find out the perfect rice to liquid ratio when cooking rice in the crock pot alone. It’s 1-1.5. The crock pot’s lid sits on the pot so tightly, only very little liquid evaporates actually. Chicken juices and water content released by veggies and herbs in this recipe account for about 1/4 cup liquid. So this specific chicken and rice crock pot recipe will require 1.25 cups of water for the 1 cup of brown rice used. How Long Does it Take to Cook Chicken in a Slow Cooker? 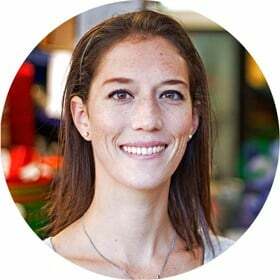 Google search reveals chicken takes 2-3 hours on high or 4-5 hours on low. That calculation apparently applies to all chicken parts. Chicken breasts, chicken thighs, legs, wings…. I tested my Crock Pot Chicken and Rice with chicken breasts and boneless chicken thighs and I must say the chicken thigh version was better! Chicken breasts kind of dry out when they’re not drenched in some sort of sauce. In this recipe the chicken sits on top of the rice and isn’t “boiled” so to speak but rather steamed. Dark chicken meat can handle slow-cooking a lot better than than white chicken meat. I highly recommend using chicken thighs. You can even leave the bones in for extra flavor and discard later. After 2 hours on high the boneless thighs reached the safe temperature of 165F. The rice wasn’t cooked by then though. After 3 hours, the brown rice was cooked and the chicken thighs still had a great texture as opposed to the chicken breasts. To make this Crock Pot Chicken and Rice healthy it obviously needs a lot of veggies. I love using veggies that hold their shape when cooked for a long time. Carrots, celery and bell pepper are perfect for that! You can also use other vegetables though and simply add later in the process. Zucchini, mushrooms, artichokes for example would taste pretty amazing in this, too. The large amounts of cilantro make this recipe super special. It’s what gives the dish it’s main flavor. The Peruvian touch! If you also get your hands on Peruvian “ají amarillo” I highly, highly, highly recommend you add about tablespoon to the sofrita (sautéed onion and garlic). 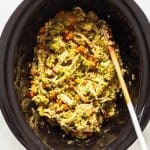 It will transform this Crock Pot Chicken and Rice from a great recipe to an OUT OF THIS WORLD recipe! Prepare veggies: Peel and dice onion and peel and crush garlic. Wash, deseed and dice bell pepper. Peel and dice carrots. Wash and dice celery. Prepare cilantro water: wash cilantro, shake excess water out a little and add to a blender, stems and all. Add water and blend until smooth and more more herb leaves float around. Prepare sofrita: Preheat a small pan over medium heat, add a dollop of oil and fry diced onion and crushed garlic until nice and brown. If you have, add Peruvian ají amarillo once onions are translucent. Crock Pot Prep: Add sofrita, brown rice, sea salt, pepper and cilantro water to crockpot and give it a quick stir. Add diced vegetables on top without mixing into the rice. Just smooth out into one layer. Then top everything with salted and peppered chicken thighs. Cook: Add the lid to the crock pot and seal it. Set the crock pot to high and adjust the timer to 3 hours. Ensure with a meat thermometer that the chicken's internal temperature is at least at 165F. Serve: Use two forks to shred the chicken and mix everything well together. Season with more sea salt and pepper if necessary and plate. This looks delicious! Can I use long grain rather than short grain brown rice? Yes Karen! Just add 2 minutes to the pressure cooking time. Looks delicious but I would like to try make this using low heat… would you be able to recommend a time on this setting? Hi Marlene, I haven’t tested it on low heat but from experience it’s always double the time of high. Try with 6 hours, I’m pretty sure it’ll turn out great that way. 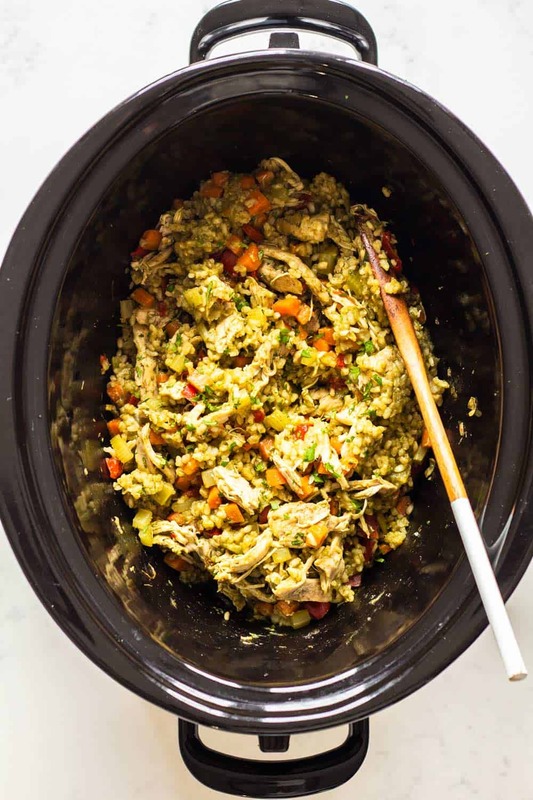 Have you ever used the slow cooking option of your Instant Pot? Yes, I’ve tried it and I’m not in love. I mean if I didn’t have a slow cooker I would use it but since I do have a slow cooker I prefer to use that one because it heats evenly also on the sides. The instant pot heats only from the bottom and I feel it takes a lot longer to slow-cook stuff.